Enjoy a tour of Halawa Valley on the eastern end of Molokai. Spectacular mountain scenery, ancient historical and cultural sights along with historical narration provide insights to life on Molokai. Drive to Halawa Valley, the only one of Molokai's five epic valleys that is easily accessible. The Halawa Cultural hike is not just a hike to the waterfalls, but full of historical information about East Moloka'i's Halawa valley. You will vist taro patches and see how this staple food of the Hawaiians is grown, as well as a Hawaiian fishpond where Hawaiians cultivated fish in harmony with the natural cycle of preservation and regeneration. The hike is rated as intermediate to advanced, with a distance of 2.2 miles each way. It has two river crossings, and some rocky areas along the trails, with possible fallen trees after a storm. Please be advised to bring insect repellant, sunscreen, swim wear and a backpack to carry personal items. Kalani also runs hikes in Halawa Valley on certain days and he has the flower farm down there. If you want to tour his farm , Molokai Flowers We recommend both of them as they both offer unique parts to their tours. If you want culture then you must see Uncle Pilipo or his son Greg. If you want to be amazed by flowers then Kalani is the one for you. Or if you can not decided then do both, maybe just the hike with Halawa Valley Cultural Hike and then the flower farm tour with Kalani! There is incredible hiking on Molokai however, much of the land is privately owned so hiking on your own is limited to the beaches and some trails in the forest. We recommend that you sign up for a tour associated with a hike, like the Damien Tour which gives you a permit to hike down the trail into Kalaupapa, or the Halawa Cultural Hike which goes to Halawa falls. The white sand beaches on the west end of the island will satisfy you with beach hikes and swimming when the conditions are suitable. We strongly recommend that you talk to the locals about safe places to swim. You can access Papokaku beach at the park or other public right of ways which are clearly marked along the road. Papohaku is one of the largest beaches in Hawaii at about 100 yards wide and 3 miles long. The Papohaku Beach Park includes a camping area operated by the county, permits are required. Please note that during the winter months the surf can be dangerous and swimming is not recommended. The public beaches accessed from Kaluakoi Villas and Paniolo Hale condominiums also provide hiking opportunities. We are offering a shuttle service to take you on the 4wd road to the forest. Rental Cars are not allowed up there and this is typically a road we would like to stay free of crowds. You will totally understand that when you get up there! Like the Nature conservancy with their hikes we do not want to crowd the forest so will offer a shuttle once a week and our maximum is 6 person, so we can get booked rather quick, weather dependant to the forest. 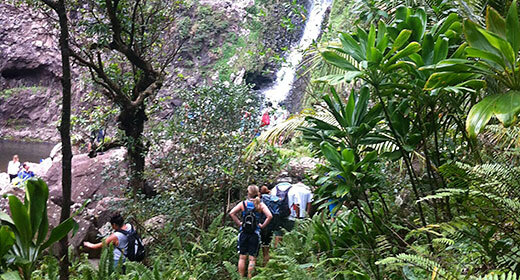 We will give you the Molokai Golden rules of what to do and what not to do and let you know which trails are Ok to hike. Once we take you up to Waikolu Lookout, you are free to explore the different trails in the forest and our shuttle driver will wait for your return. We typically leave for the forest from 7-9am and this is a full day if you plan on hiking for the day. Call our reservations 1-855-208-0811 (booking number) 1-808-336-0946 (Clare's cell) for more information of email us. Cost: $125 r/t and includes taxes, a VHF radio (safety purposes), pancho for rain, and a cooler of non-alchol beverages and a driver who will wait for you while you hike the forest. The Nature Conservancy offers guided hikes at two of their preserves on Molokai. The Mo'omomi Preserve hike along the northwest shore of the island and the Pepeopae boardwalk hike through the rainforest in their Kamakou Preserve. These hikes fill up fast so it is advisable to inquire about reservations in advance. We recommend contacting The Nature Conservancy for more information about access to the preserves, local protocol and educational information on how to prevent accidental introduction of invasive seeds into Molokai's native natural areas. The Molokai Land Trust also offers a volunteer program where you can visit the NW corner of Molokai and do some unbelievable work at one of the most incredible spots on island. We are trying to plan something with them so stay tuned. Hiking To Kalaupapa-TRAIL IS CLOSED UNTIL FURTHER NOTICE DUE TO LANDSLIDE-will keep you updated once we know more but realistically we are looking at the end of 2019 or sometime during 2020!! Molokai Outdoors Activities offers two options for those wishing to hike the Kalaupapa Trail. (We also sell a t-shirt to mark the moment with.) Option one is to hike in and fly out and option two is for those who really want to test their stamina by hiking in and out. For more information or to make reservations see the Kalaupapa Hiking page.